Set in 100 acres of pasture, orchards and gardens for you to unwind in, you will find Pit Paddy Barn at Cusgarne Farm, with its lime washed walls, slate and wooden floors, underfloor heating and wood burner, a tranquil countryside retreat perfect for families or close friends. 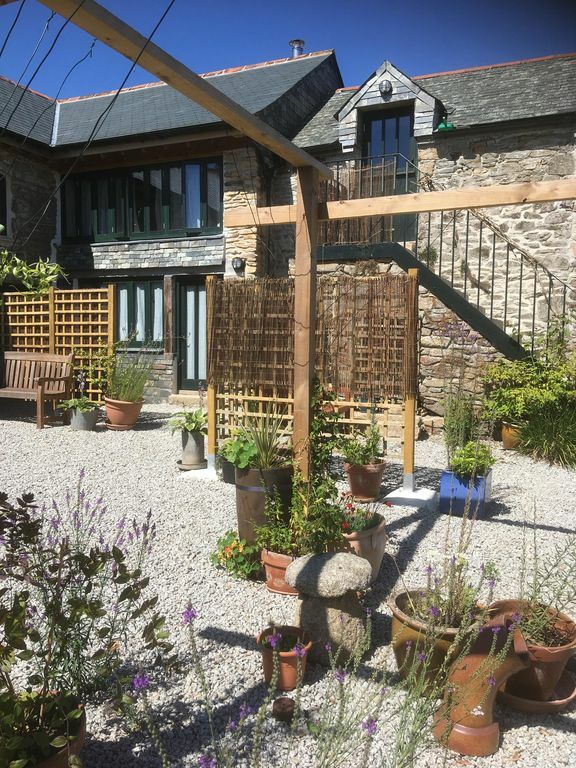 Facing west, and one of four barns set around a courtyard, Pit Paddy Barn has an airy upper floor with an open plan kitchen/living room/dining room while the ground floor has a spacious en suite bedroom with adjoining room with day bed, opening out on to the courtyard. From the courtyard is a wild orchard with fire pit and tables, perfect for lazy lunches and sunbathing, the only thing that might disturb you is a wandering chicken or two. Cusgarne is a working organic farm, rearing pasture fed organic Angus cattle, chickens, bee hives, apple and soft fruit orchards, vegetables and acres of grazing. There is a little farm shop on site, stocking all our produce, along with local artisan foods, wines, wholefoods and a little general store, along with an organic coffee shop. *Bird watching - 30 years organic has created a haven for over 90 species of birds, which we welcome our guests to watch. Described by the Telegraph as the hidden gem of Cornwall, Cusgarne is beautiful little rural hamlet with small winding lanes, far from the madding summer crowds. Equidistant between the north and south coasts, Cusgarne is a fantastic spot for enjoying all that Cornwall has to offer. Fabulous restaurants on both coasts are within easy reach and for the more adventurous, you can book sailing, kitesurfing and windsurfing lessons on the south coast and surfing lessons / coasteering on the north, while less than a mile away is the coast to coast cycle trail which runs from Devoran to Portreath / Porthtowan. *Accommodation note - please note that to access the bathroom, occupants of the adjoining room will have to walk through the main bedroom. If all accommodation on the farm is booked, we are able to sleep 18 people - please contact us for further information. *Environmental note on the barns - Powered by 100% renewable energy sources and meticulously restored over the past 5 years using the finest natural building materials, the thick cob and stone walls keep the barn cool in the summer, while the eco-insulation and biomas powered underfloor heating ensures a cosy winter. *Allergies - if you have allergies to specific building materials, please contact us for a full list of products used. One well behaved dog allowed at £30/visit. Please do not allow on the beds or sofas. Doggie welcome pack provided, poo bags, poo bag bin, towel, outside tap and dog bath. Please request on booking. We really enjoyed our stay in the beautifully converted farm buildings with lovely courtyard and some very friendly animals. So much of Cornwall's beauty on the doorstep and a superb organic farm shop - delicious. Wonderful cottage, wonderful location and wonderful hosts. Our visit could not have been more perfect! The barn is beautiful, cozy, and comfortable. Our hosts Teresa and Greg were great. The local Cusgarne Organic Farm has delicious food and a helpful supply to keep our cupboards stocked. I would recommend this place to any and all who want a perfect relaxing stay or a launching off point for daily adventures. My kids fell in love with their dogs and cats and enjoyed feeding the animals. We all left a little of our heart in Cusgarne Farms.